Dental implants can be used to replace a single tooth, a group of teeth or even a full smile. Here at Rainbow Valley Dental we work as part of an implant care team, giving you the best state of the art implant experience. Every dental implant procedure begins with a consultation. In our team approach we will evaluate and review options for the type of restorations (teeth) we can provide. Our surgeons will also provide and consultation to evaluate and make sure implants will work for you. Together our dentists and surgeons will collaborate to make a treatment plan customized for your specific needs. Once the treatment plan is complete we will review all fees. In many cases the dentist may need to gather some information needed to provide temporary teeth if indicated and make any specific fitting guides needed for the case. The oral surgeon will place the implants. If the implants involve front teeth a temporary solution may be placed on the same or subsequent day. 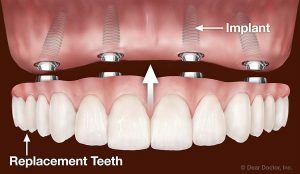 Once the implants are placed there will be a healing period before final or permanent teeth can be placed on them. Final impressions will be taken and the final crowns or prosthesis will be tried in and fabricated. Your new permanent teeth will be tried-in and ultimately made part of your smile. It’s not uncommon to need some adjustments as a patient gets used to their new smile. We often need to replace missing teeth with a removable prosthesis such as a full or partial denture. We offer a full range of prosthetic options. Our dentures are made in the USA and are custom fit for each patients. There are a number of types of dentures we take the time to discuss the options and compare choices to get the right treatment for each patient. The goal of any prosthetic service is function and aesthetics. Not only does it need to work but it should look natural. At Rainbow Valley Dental we strive to make dentures that look completely natural. We offer hard plastic, soft flexible materials and metal reinforced prosthetics. We can work with combinations of crowns, bridges and implants when designing a denture. Each patient has unique needs and custom design a solution that is right for an individual. We know sometimes the choice to move to dentures is a financial one. We understand and will discuss all fees prior to the start of any treatment. Payment arrangements are available. Have troubles with your existing denture? We are happy to take and look and see if a repair or reline would be an option. Some relines can be done right in our office.